It’s Easter, and therefore a time when many of our thoughts turn towards that sumptuous cocoa-based confection: chocolate. If you believe psychologist Murray Langham, chocolate is not only a delicious dessert but can also serve as a reflection of one’s personality. Meaning that what you choose out of a box of chocolates (milk, black; round, square) can actually illuminate some part of who you are as a person. Unlock the clandestine secrets of cocoa by taking a simple–and delicious!–test: all you need to begin is a box of chocolates. Suppose for a moment that the shape of the chocolate you choose could reflect aspects of your personality…. If given a box with all the usual chocolate shapes, you naturally gravitate towards a circular one, you’re someone who enjoys a good party and prefers to be surrounded by a large group of friends and acquaintances. Extroverted, friendly, and warm, you share your good cheer with everyone, even if it can occasionally be a little over the top. Say, however, you like round chocolates, but not perfectly circular ones…you prefer an oval. Ah! You must be creative, sensitive and sociable: a thrill-seeker who enjoys taking risks and pushing to discover your limits. When life is less than thrilling, however, you prefer to keep your worries and concerns to yourself. Choosing a square chocolate means you’re a solid and balanced person. You prefer the concrete over the abstract, and logic is king for you. You likely exhibit a meticulous and rigorous nature, although these otherwise positive qualities can sometimes keep you from fully enjoying certain moments of your life. What if your gaze turns towards a rectangular chocolate? You’re a calm and settled person…loyal, protective and stable. You like to listen and prefer to let others go first. More familiar with reason than passion, you’d rather avoid potential problems than begin a complicated relationship. Finally, there are the triangular chocolates. If that’s your type, then dynamism is the word that defines your days. Hyperactive, exciting, and excitable, you don’t let too much planning slow you down! Independent, you make your decisions alone and like to be the leader in whatever situation you find yourself in. 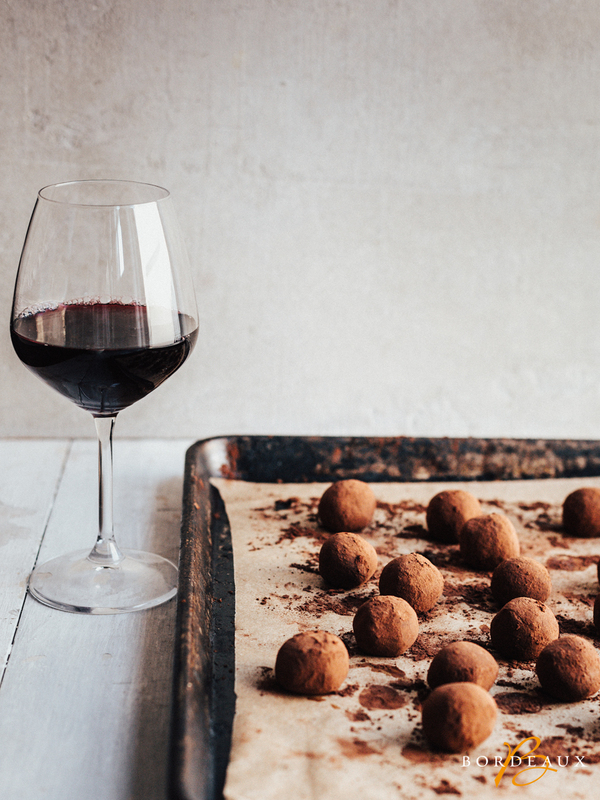 Here at Bordeaux wines, we’re rather agnostic about whether your choice in chocolate can truly reveal innate personality traits, but what we do know for sure is that some wines definitively go better with certain types of chocolate. Milk chocolate, as the name would suggest, is made by adding milk to cocoa and sugar, and it reigns supreme as the most popular option for Easter chocolate. When drinking wine with milk chocolate, we suggest either an unoaked or very lightly oaked AOC Bordeaux rouge or a Côtes de Bordeaux. Light and fruity–there’s something about a young red wine that just goes perfectly with milk chocolate. Dark chocolate contains antioxidants, little to no milk, and is relatively low in sugar, giving it a reputation as the chocolate most beneficial for one’s health. We like to pair dark chocolate with a deeper, richer Bordeaux from the Côtes. Focused and pure with silky tannins, these wines are redolent of sweet, ripe, dark red fruits notes and often exhibit a hint of licorice or chocolate (!) on the finish, making them a natural partner for the “healthy chocolate. Finally, there’s white chocolate: made from sugar, milk, and cocoa butter (the lack of cocoa solids is what renders it white), it’s an effective alternative to traditional chocolate styles. We find that white chocolate is best enjoyed with something sweet and bubbly like a rosé Bordeaux sparkling wine. These delicate pink wines have a refreshing mouthfeel, creamy mousse, and lively bright red fruit flavors that bring out the best in white chocolates. In the end, however, whatever chocolates you choose this Easter, we hope you enjoy them with Bordeaux wines! What happens to Bordeaux’s vineyards in winter? Enjoy a traditional French holiday table with Bordeaux Wines!